1. Clinical trials registry listing. All trials initiated on or after July 1, 2005, must be included in a clinical trials registry. Trials that are now underway must be included by Sept. 13, 2005. Each trial "should be given a unique identifier to ensure transparency of clinical trial results" that would permit tracking the trial results through multiple databases. The U.S. government's trial registry site (www.clinicaltrials.gov) was specifically promoted as an acceptable registry model. 2. Timely posting of results. Results for all trials completed after Jan. 6, 2005, must be posted in a timely manner, generally within 1 year after the drug is first approved and commercially available in any country, or, for trials completed after approval, within 1 year of trial completion. An exception is made if posting would compromise publication in a peer-reviewed journal. The database should include results of all non-phase I trials "conducted on a drug that is approved for marketing and is commercially available in at least one country," according to the proposal. Furthermore, the data must be disclosed "on a free, publicly accessible, clinical trials database, regardless of outcome." The deadlines for registration outlined in the proposal match the mandatory deadlines issued by the International Committee of Medical Journal Editors last September. The ICMJE will require clinical trials registration prior to publication of drug trial results in member journals (including the Journal of the American Medical Association and the New England Journal of Medicine). This mandatory requirement was one of the reasons the pharmaceutical groups included a registry in their proposal, Maciej Gajewski, manager of health care systems issues at IFPMA, told this newspaper. But more significantly, the trade organizations hope that a voluntary international registry and results database will preempt the efforts of individual governments to enact their own clinical trials legislation that would make it difficult for member companies to operate efficiently on a global scale, Mr. Gajewski said. For example, legislation was introduced in both houses of the U.S. Congress last October to mandate both trial registration and data disclosure. Although the bills did not pass, proponents say that they intend to submit similar bills this year, even in the face of the new pharmaceutical industry proposal. A significant difference in the congressional approach is the introduction of penalties for noncompliance of up to $10,000 per day. In addition, their proposed registry (which would build upon www.clinicaltrials.gov) would include trials of biological products and devices, as well as drugs. The focus in the position paper and the ICMJE statement (and mirrored in the federal legislation) on using www.clinicaltrials.gov is controversial. Last year, editors at the British Medical Journal refused to fully join their ICMJE peers and rejected the premise that that registry was the only appropriate option. In a September 2004 editorial, Kamran Abbasi, acting editor of the BMJ, called www.clinicaltrials.gov restrictive in its requirements that drug trials follow certain U.S. requirements, including the filing of an investigational new drug application at the Food and Drug Administration. His journal is concerned that many nondrug, non-NIH-sponsored trials from developing countries would be excluded. "These restrictive entry criteria will not be met by many trials worldwide," Mr. Abbasi wrote. Requiring worldwide adherence to FDA regulations also concerns the IFPMA, Mr. Gajewski said, because "more and more trials are being conducted in developing countries." He declined to comment, however, on the next steps in moving forward with the clinical trials registration and the databases, given that some of these are events involve nonpublic, industry-related issues. Last October, PhRMA launched its own results database for use by health care professionals and the general public (www.clinicalstudyresults.org). The database provides a home for industrywide voluntary listing of nonhypothesis testing drug clinical trials completed since October 2002 for all approved drugs. In a statement, GSK "welcomed" the announcement of the joint position paper and declared that the company will continue to post on its own site as well as "post information about GSK-sponsored patient trials initiated on or after Nov. 1, 2004, on clinicaltrials.gov." Not everything went wrong for big pharma last year, but it might have seemed that way to some companies. Attacks came on several fronts, from journal articles to journal editors to the courts, and even legislators in the U.S. Congress and British Parliament. In May, a report in the Journal of the American Medical Association highlighted the need for full disclosure by the industry of drug trial outcomes. An-Wen Chan, M.D., and colleagues at the Centre for Statistics and Medicine, Oxford, England, reviewed the original reports behind 122 published studies of 102 clinical trials. They found that overall, 50% of efficacy outcomes and 65% of harm outcomes per trial were incompletely reported. Furthermore, 86% (42 of 49) of trial investigators surveyed denied the existence of unreported outcomes despite clear evidence to the contrary (JAMA 2004;291:2457-65). "The reporting of trial outcomes is not only frequently incomplete but also biased and inconsistent with protocols. Published articles, as well as reviews that incorporate them, may therefore be unreliable and overestimate the benefits of an intervention," the authors wrote. In June, the American Medical Association endorsed the concept of clinical trial registration, and GlaxoSmithKline was sued by the state of New York for concealing negative information from clinical trials related to Paxil. In August, GSK agreed to a settlement that required posting a summary on its corporate Web site of every company-sponsored drug trial completed after Dec. 27, 2000. In September, Forest Laboratories, manufacturers of the antidepressants Lexapro (escitalopram) and Celexa (citalopram) in a separate agreement with the state of New York, said it would post clinical study results completed since Jan. 1, 2000, for its marketed drugs. That same month, the International Committee of Medical Journal Editors issued a requirement that clinical trials be registered by July 1, 2005, for results to be published in member journals. 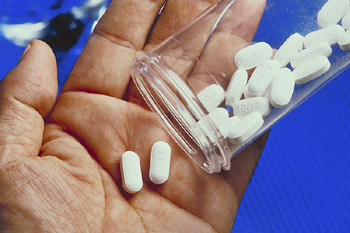 Problems with cyclooxygenase-2 (COX-2) drugs came to light, and Merck pulled Vioxx (rofecoxib) off the market after its own study revealed an association between the use of the drug and an increased the risk of cardiovascular events. In October, bills were introduced (but not passed) in the U.S. Congress that would mandate registration of all clinical trials and provide penalties of up to $10,000 per day for noncompliance. And in November 2004, the Medicines and Healthcare Products Regulatory Authority (the British version of the U.S. FDA) announced its intention to add members of the general public to its regulation of medicines committee, in part to limit industry influence.